Mention curry and the East End in one sentence and many people will think of Brick Lane, also known as ‘Bangla Town’. There’s a concentration of curry houses on the southern end of this iconic street but the touts trying to lure you into the restaurants with special deals are a giveaway; most of these places are mediocre at best. I’ll therefore swerve Brick Lane and head a bit further south towards Whitechapel where you’ll find the legendary Punjabi run Tayyabs. I’ll go weak at the knees at the aroma of the sizzling platters of marinated lamb chops and shami kebabs that hits you upon entering and you’ll notice a steady flow of waiters bringing these out… (tip: order the lamb chops!). The curries come out in karahis (small wok-like vessels) and are so incredibly satisfying – rich with ghee and expertly spiced. 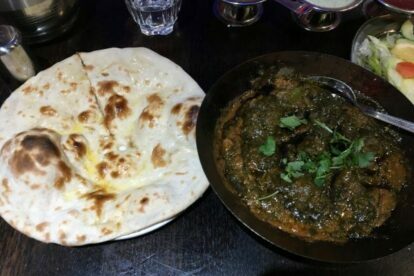 Aside from the dry keema curry which I’ll often order, the vegetable dishes such as sag paneer (spinach) and dahl with aubergines are superb. Service is brisk – often a bit too brisk, as they try to turn tables in order quash the queues that inevitably form. It’s also worth noting that as this is a Muslim-run establishment, they don’t serve alcohol, but you can bring your own to drink without corkage. Bonus!